The Joint Opposition (JO) today rejected remarks made by President Maithripala Sirisena that former president Mahinda Rajapaksa had abstained from voting for a no-faith motion against MP Ravi Karunanayake and said the President had been mislead. He told a news briefing that two no-faith motions were handed over to the Speaker against the MP but they were not taken up for a debate, let alone a vote. “The first no-confidence motion was submitted when Mr. Karunayake was finance minister over irregularities in budget expenditure. This motion was included in the parliamentary agenda but it was never taken up for debate. 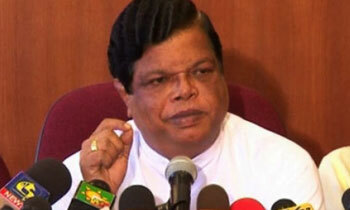 The second motion was submitted when Mr. Karunanayake was the foreign minister, over the Central Bank bond scam. This motion was not even included in the parliamentary agenda. When the situation is like this, how can Mr. Rajapaksa congratulate Ravi Karunanayke and say that he didn’t vote for the no-faith motion,” MP Gunawardana said. He said Mr. Rajapaksa was someone who instructed the JO to draft and prepare the no-faith motions against Mr. Karunanayake and hand them over to Parliament immediately. Why you mislead ALL THE PEOPLE saying a family can live for a month with Rs. 2500 . MS just talks to gallery without facts and figures...they were not taken up for a debate, let alone a vote. This president is careless! He has already displayed his unsuitability to lead the nation. He makes erroneous statements which are detrimental to the country. He is mad and obviously anybody will be mad when you see this mess in the country. However, isn't he responsible for all of this since he is the president. If he and PM can blame Mr. Rajapaksa for all the evils of the previous government, why can not they take the blame for what they have done so far under the good banner Yahapalanaya? The President is not a kindergarten child like yours!